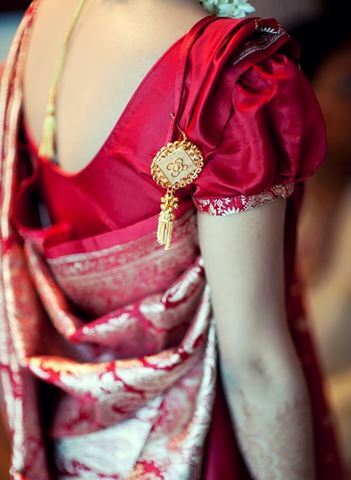 The most important element in getting your saree look right would be the makeup, the jewelry, the accessories, and above all the design of the blouse. 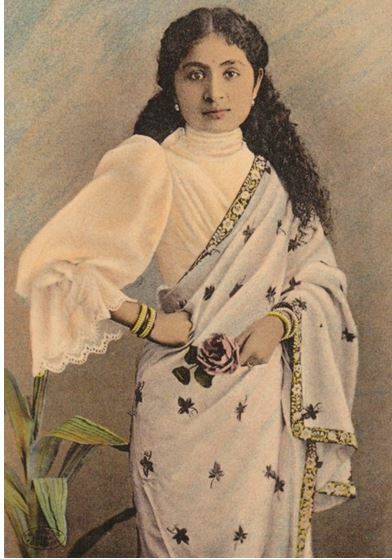 Considering that the blouse in itself holds such importance for making a saree look its best, each aspect of the blouse’s design –be it the neck in front, the embroidery , the border usage, the back and of course the sleeve, which would all come together to create the most appealing of creations. From the sheerest of full sleeves to the chic sleeveless-even not having any sleeve manages to make it to the list of fashionable sleeves-such is the effect of presence or absence of sleeves in any design , that it can truly impact the very look one is trying to create. Take for example the full sleeved blouse-it instantly adds a look of sobriety, the minute you change its fabric to net or lace, the look can change to party wear. Another example could be the short sleeves-make it a cap and you are all set for a dance party, make the same cap sleeve get a more embroidered look and the same cut could be played up for a more formal occasion. Thus blouse sleeves do serve up a mood, a stance and a look -and thus playing with its design has been looked at with ample seriousness by designers who create a new fresh look each season. A new spin is added to the blouse that essentially tweaks the neck and the sleeves-playing perhaps with the length, the fabric and the cut. My favorite this season has been the ever popular short puff, and the reason why it is so great is that is suits almost all women. The puff allows the sleeves to give the arms a slimmer feel and adds that informal edge to your look. It’s great with heavy sarees like those gorgeous heavy brocade sarees that can be worm with velvet blouses with lace trims. The heavy material gets a respite from its look with the use of fine lace- In fact it’s a very old fashioned Bengali styled blouse that was mostly worn in Zamindari families. The look makes for many variations and the most popular ever is the frill at the trim of the blouse that adds that certain edge of feminine beauty to the look- a romantic period look for all to enjoy wearing! Suited mainly for those who have broad shoulders the classic cap sleeves is perhaps one of the simplest of sleeve designs and packs in a punch when given some embroidery and embellishment in the form of trims, frills, froth or motifs that are attached to it. This form of sleeve construction can be done with stiffer fabrics as well as soft ones. It is most suited for women who are broad shouldered. Whether the saree is light or heavy, an embellishment on sleeves especially created with the same color scheme as the saree will weave its own magic on the look. 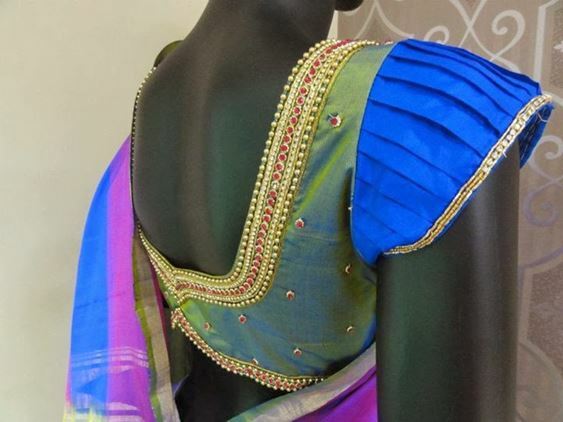 For instance the gota patti and stone work on the first one and the pleated peacock blue offsetting the blue in the border of the saree. A simple variation that kind of takes care of not going completely sleeveless, the frothy sleeve allows ones arms to look slimmer than they really are. The most suitable saree to wear with this would be nets and anything that is light and diaphanous. For women who are narrow shouldered and tall there is always the fear that blouses with very short sleeves on them will make their lower body seem too large and thus for such body shapes where the women are not too heavy on top-the option of wearing jacketed sleeves is the best. The other option could be the layered sleeves that gives more volume to the top of the torso. At one point in time this was the most preferred length worn by most working women and the lower the sleeves got, the more formal would be the occasion, but in the present scenario, the change in fabric usage and embroidery has worked magic into the half length sleeves as in the three examples below. A subtle change made with a change in the fabric used as well. This soft chiffon puff sleeved blouse sleeve can be given an extension. It immediately makes the blouse get a period look with vintage feel. The sleeves can then end in gathers at the wrist. Could be worn with Bengali styled sarees, chiffons and lighter net sarees as well. Something extremely feminine and flirty about this style. Here is the same puff given a much more ballooning effect with the use of either very fine muslin or with chiffon. One can see that the bunching is much lower in the lower portion of the arm from where there is a frill that ends in a lace trim. A gorgeous design that can be replicated in the present time to great effect and worn with light floral chiffons or solid colored net sarees. The perfect way to dress up your silk sarees in particular, this is the best length in fact if you are intending to draw attention to your bangles and bracelets. 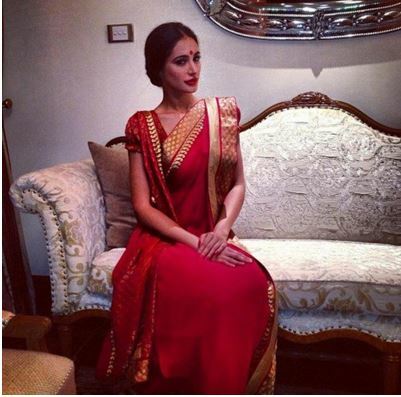 Makes ones saree seem all the more formal. This is the preferred sleeve length in case your arms are on the heavier side especially on the top. If you happen to get a lot of wok done at the cuff do go sparse on the bangles in that case or else the work on the sleeve would be a waste. Wear instead a thick kada. This ivory silk blouse has the look to make it team with any saree in pale shade or pastes –even heavy chanderis, and chiffons would look great with it. The favourite with most, this sleeve gives ample area to experiment with fabric and design. There has been adeqaute amount of design experiments in this length with truly dramatic results. Here are some stellar ways in which the long sleeve can be made to look great for several occasions-be it a wedding, a conference or even a cocktail party. 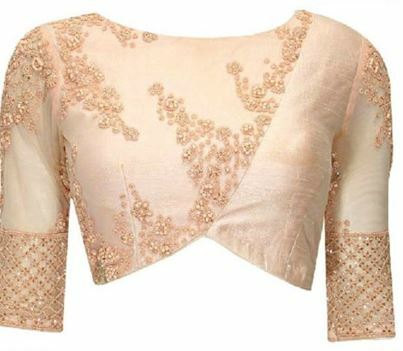 From the thickest of velvet to the sheerst of chiffon can be used to create the magical looking sleeves. Whatever blouse sleeve that you may decide to choose, remember that it must be suitable to your overall cut of the blouse, its style of neck design, and the occsion that it is going to be worn. One would surely not decide to wear a sheer sleeved sleeve for a working lunch while at dinner with family you could not like to wear a full sleeved silk brocade blouse. Sleeves could in fact play up or play down the look of a blouse and consequently your entire look-so a lot is in your hands!